A day Michael made landfall as a deadly Category 4 hurricane, 10Weather is re-focusing on monitoring a tropical disturbance we've been watching in the west-central Caribbean Sea. And, this one has a 50 percent chance of developing by early next week. The National Hurricane Center (NHC) is calling this Disturbance 1. It hasn't become a named storm yet. This system is forecast to slowly move westward toward Central America through early next week. Conditions are expected to support some slow development, but interaction with land could limit the chance of additional development once the system approaches Central America on Monday or Tuesday. 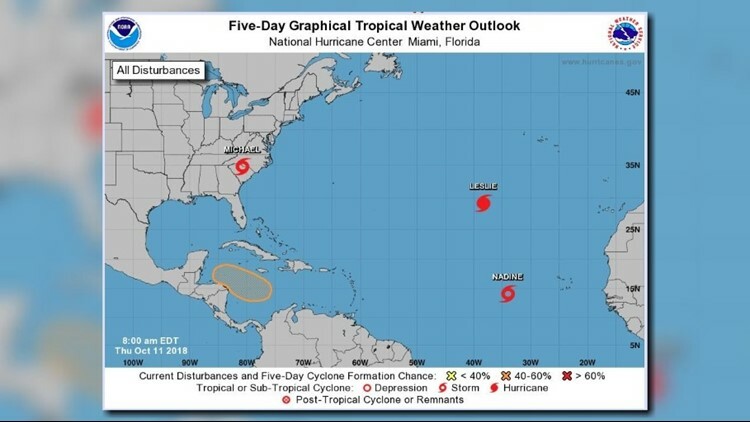 The NHC gives the disturbance a zero percent chance of development over the next 48 hours -- but then a 50 percent chance of development over the next five days. It's too early to say what could happen, but this is something our meteorologists are watching very closely.